We hope this finds you well, happy and sassy! We are planning for a fun Friday and Saturday at 1pm with the Miinnesota Road Show demos. Boy, the four designers from the north have done it again. The projects They share in the trunk show are cool and a lot are small items that can easily be done in a day. There is also a home decor side to it. Here are some of the samples. We hope you will join us in the fun. A learning and fun time will be had by all. There is a class scheduled with Kim Ewing on Monday, January 17th. It is Stack and Whack, the easy way. 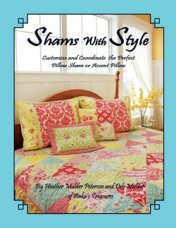 She provides you will your pattern and at the end of the day I bet you will have a bunch done. There is still time to sign up for this great class. It is $35.00 and begins at 9am and ends at 3:30. There is a lunch break. 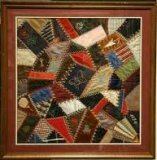 We have had a request and we do try to fulfill them (okay, no 50% off sales) and this involves several people who were unable to attend our first Crazy Quilt Session. Another Session One is being offered on Tuesday, January 18th. It is from 10am to 2pm and costs $25.00. We are doing this class in three sessions and if you sign up for them all at once, it is $65.00 for three. The next two sessions will be on Tuesday, February 1st and Tuesday, March 1st. 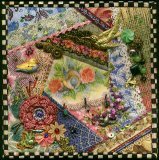 This is what you have always wanted to do - a crazy quilt and we are starting out with the basics. Hope you can join us. Thursday,January 13th, the classroom is open for a UFO sewing day. The cost is $10.00. A reminder for your calendar is that Marsha from Checkers will be here for a Demo day on Rulers on Thursday, January 20th at 11am and 1 pm. It is FREE! Remember ou Birthday Celebration begins on Friday, January 28th and the party will be happening on Saturday, January 29th. The Pokey Challenge is due on Saturday, January 15th. They will be on display starting on Monday, January 17th. Hurry and get your entry in and stop by to vote for "Viewers Choice." Jane Sassaman spaces are still available. Call or write for more information. You do not want to miss this one. All of this information can be found on our website. We hope to see you at the Minnesota Road Show and in honor of how different we are all green fabric will be 25% off except for batiks, Beach Walk and Jane Sassaman. Minimum cut is one yard but you can buy more at 25% off. No Clubhouse points are awarded or gift certificates redeemable on sale merchandise. Remember you have until the end of January to fill your cards and the end of February to redeem your gift certificates.